Two people face each other in the box ring, full of muscles and full of tension. Sweat is rolling down on one guy’s face and blood on the other’s, as they are: hunching over a chess board. The two opponents have noise-cancelling headphones on to filter out the classical music we hear, and I wonder how much a headphone can do about the blood rush in the head. Because one of the guys does not look great. And he has about one minute left to win this game by chess mate, before the fight music returns, and his opponent begins throwing uppercuts to his head. 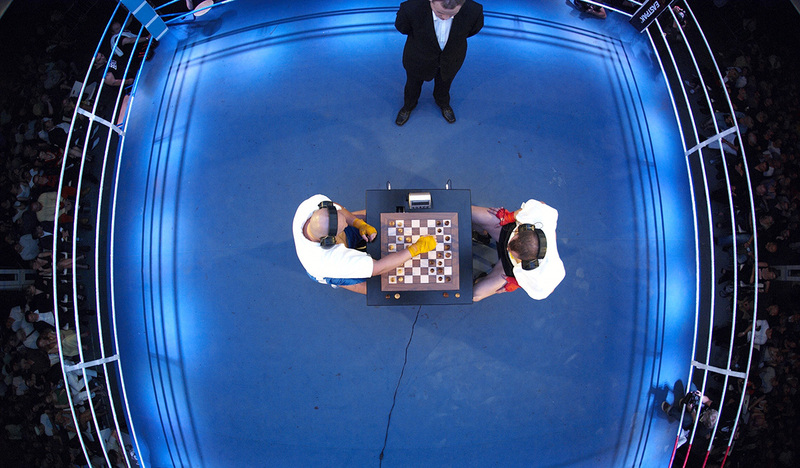 This is the wonderful sport of chess boxing. We went for a real mens’ night out with friends a while back, and discovered chess boxing on an “Intellectual Fight Night”. The post I wrote after the event continues on Yakuzuzu.